Cables are created in the same way as Members. 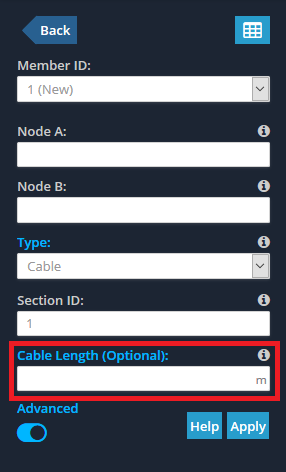 Open the Advanced UI of the Member properties and simply select “Cable” as the Member Type as shown in the image below. It is important to note that when creating cables, you are effectively drawing the chord of the cable (i.e. a straight line joining Node A and Node B) rather than the catenary cable itself. 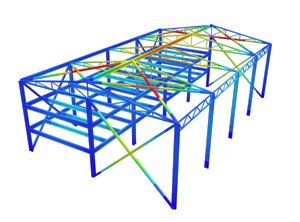 The software will work out the catenary effects and sagging automatically, so there is NO need to create a series of smaller cable elements to represent the actual cable shape. After the cable analysis runs the final axial force in the cable may be different to the force yielded by the formula above. This is because the force above is the “initial” force in the cable before the analysis takes place (i.e. the pretension). If you want to aim for a specific force in the cable at the end of the analysis then you may need to perform a series of iterations to get the intial pre-tension force correct. All cables must be loaded with at least one uniform distributed load (UDL) or self-weight. If neither of these are found, the solver will apply a small “Artificial UDL”.